The Pesky Pole : Could Papelbon Return to the Red Sox? Francisco Rodriguez signed with the Brewers today giving the Phillies one less trading partner for the services of Jonathan Papelbon. The Phillies have been trying to trade Papelbon for nearly two years and it looked like a deal with the Brewers was close to happening. The Blue Jays now appear to be the leading candidate. What about the Red Sox? The deal would make no sense now for the Red Sox, but if the Phillies do hold on to him and Koji Uehara struggles, wouldn't Papelbon fit nicely? 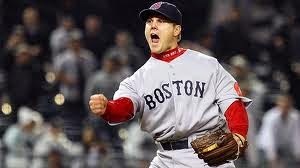 There is a ton of angst about the Red Sox rotation but I am more worried about the bullpen uncertainty. As rumors swirl about the Sox trying to trade for Cole Hamels and Cliff Lee, their best option might be the familiar face of Jonathan Papelbon.